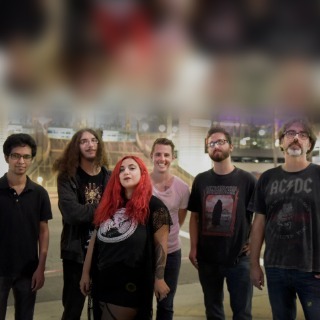 Event Horizon is a #LosAngeles based, six-piece Progressive Death Metal band that draws their sound from classical and symphonic influences; conceptual and thematic lyrical plots; and harmonious #vocal contrasts between eclectic/dynamic #female clean vocals and deep #male growls. In 2011, classically-trained guitarist/vocalist Max Sindermann began tinkering with the idea of building a bridge between #metal and classical #guitar. Taking inspiration from contemporary metal acts such as Opeth, Cynic, and Fleshgod Apocalypse, as well as classical composers like Sergei Rachmaninoff, Francisco Tarrega, and Igor Stravinsky, teaming up with Belgian vocalist Brandon Leigh Polaris, Event Horizon put out their first #EP, "The Emancipation of Dissonance" in 2013. Joined then by Jacob Alves on #Drums and David Cortes on Guitar after several years of new challenges and growth, the established union of Event Horizon released their newest EP, "A Nightmare of Symmetry" in February 2017. This EP stood out as an exemplary model of what can be achieved through musical innovation. Later on that year, EH welcomed Akhil Mahesh on #Keyboards. Through ingenuity and #creative exploration, Event Horizon prove themselves to be a unique new #voice in #progressive #music. In 2018, the band witnessed a radical change of formation; Sindermann stepped away from the clean vocals duties he had assumed, paving the way for Rachelle ‘April’ Bassili to fill that spot and front Event Horizon as their lead vocalist. The line-up was then completed in May 2018 when Cali native Maxx Richmond joined on #Bass. EH released in July '18 their newest work "Cannibal Culture,” a frantically-paced and provocative #single that takes aim at #political #discourse in the information age. Marked by masterful composing and #technical prowess, “Cannibal Culture” marks a bold new step in Event Horizon’s #signature progressive metal #sound.